Okay, it’s not really magic. The remote relies on an indoor positioning system to know where it is, and the devices you’d have it control are located within the room. And that's cool. Universal remotes have been around in one form or another for decades. Harmony introduced the first one that could be easily reprogrammed via the internet back in 2001. 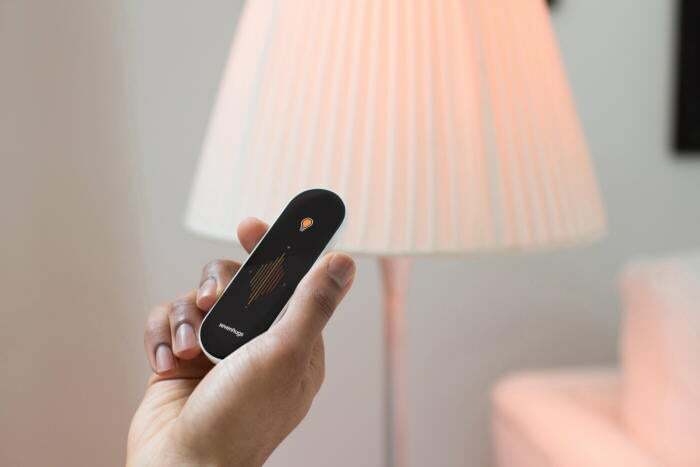 Sevenhugs CEO Simon Tchedikian says his company has come up with an even better idea: A universal remote that automatically configures itself to control whatever device you point it at, whether it’s a smart TV, a smart light bulb, or a connected speaker. “The Smart Remote is for anyone who lives in a smart home,” Tchedikian said during a recent demo. “You might be able to control all your devices with your smartphone, but your kids don’t have a smartphone. Your wife does, but she hasn’t kept up with all the apps needed to control everything. 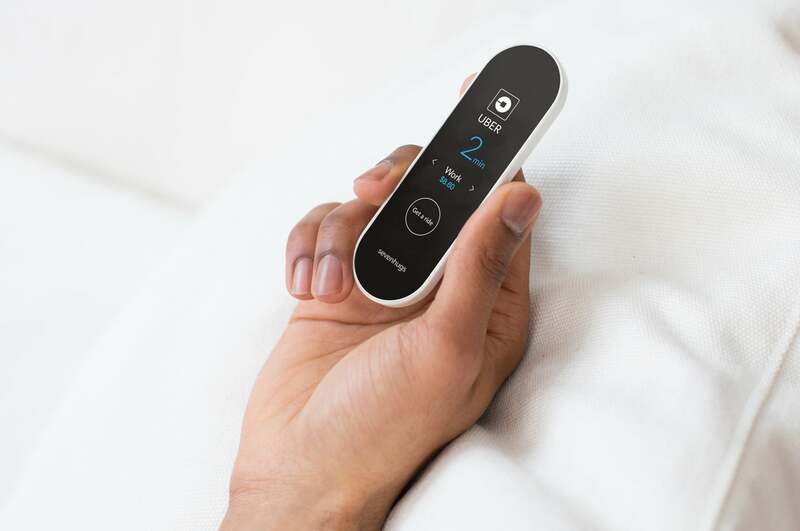 With the Smart Remote, you just point at the device you want to control, and the remote’s touchscreen will display the appropriate user interface to control it.” Haptic feedback will help you master the remote. Point the Smart Remote at a smart light bulb, and it instantly becomes a smart light bulb controller. The Smart Remote can do other things, too. You could set it up so that when you point it at the window, it displays a weather forecast. Or if you point it at the door, it could call an Uber for you, displaying the fare and the driver’s ETA after you’ve placed the order. Motion and indoor positioning sensors are what makes this magic possible. When you set up the remote for the first time, you’ll place three sensors inside the room you’ll use it. The Smart Remote then determines its location in the room by using the three sensors to triangulate. Once you’ve done that, you teach the remote where the things that you want to control are located by setting the remote next them and pushing the “locate” button. Tchedikian says the Smart Remote can determine where it’s located in the room within five to forty centimeters of precision. The Smart Remote already works with more than 25,000 Wi-Fi, Bluetooth, and infrared devices, according to Tchedikian. That list includes Samsung Smart TVs, Philips Hue and LIFX smart bulbs, Sonos speakers, and the Nest Learning Thermostat. It will also communicate with smart-home hubs, such as Wink and SmartThings, and you’ll be able to create IFTTT recipes. Sevenhugs has developed an open API to make it easy for other manufacturers to support the Smart Remote, and an SDK (software developers’ kit) is available for programmers interested in expanding its features and services. You’ll be able to link the Smart Remote to online services such as Uber, in addition to hardware devices. A button on its charging cradle will trigger the Smart Remote to emit a locate tone if it gets lost in the couch cushions or if it’s left in a room where it doesn’t belong. And that leads me to the Smart Remote’s greatest weakness, which you’ve probably already figured out unless you live in a studio apartment: It only works in one room, because it can only operate in line of sight of the three sensors it uses to triangulate its location. While it’s outside of that room, it has no idea where it or the devices you want it to control are located. Replace or supplement voice control? When I reacted with some skepticism as to how useful the Smart Remote would be given that limitation, Tchedikian replied “You have the same restriction with voice [control], unless you have multiple microphones.” And that’s why I recently deployed a half-dozen Echo Dots in my house, so that I can control the lighting and other devices that are part of my Vivint smart-home system from virtually any room I happen to be in. 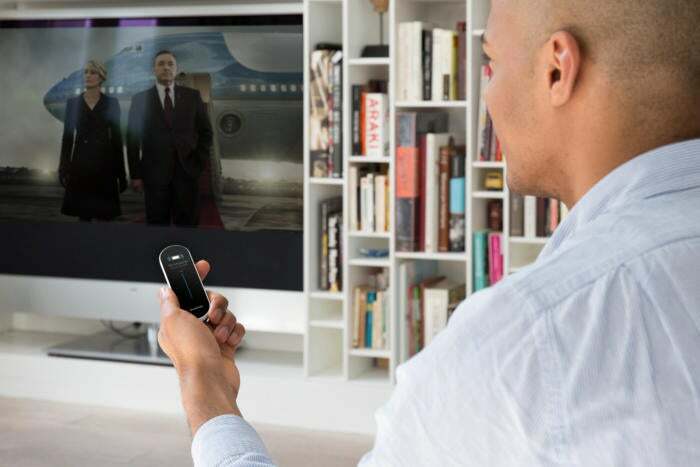 “The advantage over voice control is the [Smart Remote’s] display,” Tchedikian added. Indeed, I do find myself using voice commands primarily for lighting control; I still rely on the buttons on my Harmony Elite universal remote, because pushing purpose-built buttons is more efficient than asking Alexa to do everything, even if I do have to reach for the remote. Sevenhugs doesn’t plan to ship its Smart Remote until June 2017, when it will be priced at $299. Tchedikian said the company already has the money it needs to bring the product to market, but it launched today’s Kickstarter campaign to drive awareness and develop a community around the product. To that end, limited numbers of backers will be able to order a Smart Remote for $99, $129, $149, or $199, depending on how early they sign up, for the duration of the campaign.